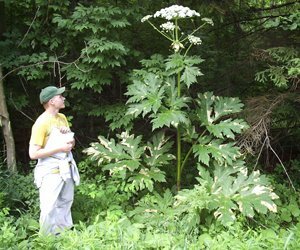 DEC Warns New Yorkers to Avoid Giant Hogweed Plants & Report New Locations. Albany, NY - July 28, 2014 - The New York State Department of Environmental Conservation (DEC) continues its ongoing efforts to control invasive giant hogweed plants across the state and today reminds residents to look for signs of the plant and report any new locations. "DEC is making great strides towards eradicating giant hogweed in New York," said Commissioner Martens. "Every property where giant hogweed can be removed increases biodiversity and helps to make outdoor areas safe for people to enjoy. It is important to raise public awareness to make sure that people know how to identify this plant, know not to touch it, know how to report it and know how to eradicate it." Giant hogweed is a non-native invasive plant that can cause painful burns, permanent scarring and even blindness. DEC warns against touching any part of the plant, as skin exposed to both giant hogweed sap and sunlight can be severely burned. As a noxious weed, it is unlawful to propagate, sell or transport. In addition to being a health concern, it crowds out native plant species and can contribute to soil erosion. Now is the best time to discover giant hogweed locations as the plants are currently flowering and setting seed. Flowering giant hogweed plants are 8 to 14 feet tall with very large flat-topped clusters of small white flowers, have a green stem with purple blotches and coarse white hairs, and large leaves up to 5 feet across. Take photos of the entire plant (stem, leaves, flower and seeds). Then, report information on plant numbers and locations to the DEC - either attach photos to e-mail ghogweed@dec.ny.gov or call the Hogweed Hotline at (845)-256-3111. If confirmed, DEC will contact the landowner to discuss control options. Although the DEC works with many regional and municipal partners to address this invasive species, the public is an invaluable partner in helping to report suspected plant locations. The DEC Hogweed Program receives about 2,000 calls and e-mails each year. Eradication efforts to date are encouraging. This year, now halfway through the field season, more than 800 properties have had their giant hogweed plants controlled by DEC and 28 percent of properties visited had no plants found this year after being controlled in a previous year. For more information about the Giant Hogweed program, visit the DEC's website. Subject: LongIsland.com - Your Name sent you Article details of "Efforts Continue to Eradicate Invasive Giant Hogweed Plants"